Forward asteroseismic modeling plays an important role toward a complete understanding of the physics taking place in deep stellar interiors. With a dynamical mass in the range over which models develop convective cores while in the main sequence, the solar-like oscillator α Centauri A presents itself as an interesting case study. We address the impact of varying the metallicity mixture on the determination of the energy transport process at work in the core of α Centauri A. We find that ≳ 70% of models reproducing the revised dynamical mass of α Centauri A have convective cores, regardless of the metallicity mixture adopted. This is consistent with the findings of Nsamba et al., where nuclear reaction rates were varied instead. Given these results, we propose that α Centauri A be adopted in the calibration of stellar model parameters when modeling solar-like stars with convective cores. Most parameters used in stellar modeling are calibrated based on the Sun, e.g., the mixing length parameter, the helium-to-heavy-element ratio, chemical abundances etc. This approach is well-suited to the modeling of stars with similar properties to the Sun, i.e., for solar-type stars with a mass below 1.1 M⊙. The quest for a more massive star with well-known properties and interior structure is of the utmost importance, as such star could become a potential model calibrator for solar-like stars having convection as the main energy transport process in their cores. The bright, nearby binary α Centauri is amongst the best characterized star systems, with a plethora of available high-precision observations, e.g., parallaxes, angular diameters, interferometric radii, metallicities, effective temperatures, luminosities, and oscillation frequencies (Söderhjelm, 1999; Bouchy and Carrier, 2002; Pourbaix et al., 2002; Bedding et al., 2005; Bazot et al., 2007; de Meulenaer et al., 2010; Kervella et al., 2016, 2017; Pourbaix and Boffin, 2016). α Centauri A is of particular interest, since its dynamical mass is in the range (1.1 – 1.15 M⊙; Aerts et al., 2010) over which models constructed at solar metallicity are expected to develop convective cores while in the main sequence. This has given rise to studies that aimed at establishing the nature of its core and at exploring the physics that affect core properties. Forward stellar modeling, when coupled with observational constraints from asteroseismology, constitutes a valuable tool in the exploration of the physics of stellar interiors (e.g., Miglio and Montalbán, 2005; Mathur et al., 2012; Metcalfe et al., 2012, 2014; Lebreton and Goupil, 2014; Silva Aguirre et al., 2015; Nsamba et al., 2018a). Bazot et al. (2016) complemented asteroseismic and spectroscopic observables with the dynamical mass determined by Pourbaix et al. (2002) to tightly constrain stellar models of α Centauri A. They explored the impact of varying the nuclear reaction rates, overshoot, and diffusion of hydrogen and helium, having found a noticeable change in the number of best-fit models1 with convective cores when nuclear reaction rates were varied. Following the revision of the dynamical mass of α Centauri A (Pourbaix and Boffin, 2016), (Nsamba et al., 2018b) (hereafter Paper I) carried out a detailed modeling of this star again allowing the nuclear reaction rates to vary, and found about 70% of best-fit models to have convective cores. More recently, Joyce and Chaboyer (2018) suggested that, if α Centauri A has a convective core, then it would be necessary to modify standard physical prescriptions (e.g., enhancing diffusion) in order to correctly model the star. Amongst the different model physics explored in Paper I and in Bazot et al. (2016), the impact of the metallicity mixture on the core properties of α Centauri A has, however, not been investigated. In this work we investigate the impact of the metallicity mixture on the inferred nature of the core of α Centauri A. The paper is organized as follows: section 2 describes the stellar model grids and sets of observables used in the optimization process. A discussion of the results is presented in section 3. Section 4 presents the conclusions. To explore the impact of varying the metallicity mixture on the nature of the core of α Centauri A, we set up two grids (A and B) with the same model physics except for the metallicity mixture (see Table 1). The stellar evolution code MESA (Modules for Experiments in Stellar Astrophysics; Paxton et al., 2011, 2013, 2015, 2018) version 9793 was used to generate the grids. Table 1. Main features of the model grids adopted in this work. where Xsurface is the surface hydrogen mass fraction. Note that varying the metallicity mixture requires setting the corresponding appropriate opacities. We used opacities from OPAL tables (Iglesias and Rogers 1996) at high temperatures, whereas at low temperatures tables from Ferguson et al. (2005) were used instead, for the respective metallicity mixtures. We employed the Joint Institute for Nuclear Astrophysics Reaction Library (JINA REACLIB; Cyburt et al., 2010) in both grids. The 14N(p, γ)15O and 12C(α, γ)16O rates were described according to Imbriani et al. (2005) and Kunz et al. (2002), respectively. We note that the 12C(α, γ)16O reaction rate is less relevant for stars on the main-sequence phase but is vital in more evolved stars, i.e., stars at the core helium-burning evolution stage. where ΔY/ΔZ is the helium-to-heavy-element relation (set to 2.0; Serenelli and Basu, 2010) and Y0 is the big bang nucleosynthesis value (set to 0.2484; Cyburt et al., 2003). Evolutionary tracks were evolved from the zero-age main sequence to the end of the subgiant evolution phase. The terminal criterion affecting the tracks is similar to that implemented in Paper I. The parameter space of the model grids is as follows: M ∈ [1.0, 1.2] M⊙ in steps of 0.01 M⊙; mixing length parameter, αmlt ∈ [1.3, 2.5] in steps of 0.1; overshoot parameter, fov ∈ [0, 0.03] in steps of 0.005; and Z ∈ [0.023, 0.039] in steps of 0.005. Each model grid contains about 156,000 models. The corresponding adiabatic oscillation frequencies of each model, for spherical degrees l = 0, 1, 2, and 3, were obtained using GYRE (Townsend and Teitler, 2013). The surface effects were accounted for using the combined-term surface correction method described by Ball and Gizon (2014). This surface correction method has been reported to yield the least internal systematic uncertainties among the different available surface correction methods (e.g., Compton et al., 2018; Nsamba et al., 2018a; Jørgensen et al., 2019). Table 2 displays the spectroscopic and interferometric constraints used in the optimization process. Run I adopts Teff and [Fe/H] values obtained in Paper I. Table 2. Spectroscopic and interferometric constraints. These spectroscopic constraints were complemented with the interferometric radius from Pourbaix and Boffin (2016). Run II adopts Teff and interferometric radius values from Kervella et al. (2016). We further note that (Pourbaix et al., 2002) derived a dynamical mass of 1.105 ± 0.0070 M⊙. This dynamical mass was then revised by Pourbaix and Boffin (2016), who obtained a value of 1.133 ± 0.0050 M⊙. Finally, the same asteroseismic constraints as in Paper I were adopted. The Bayesian code AIMS (Asteroseismic Inference on a Massive Scale; Lund and Reese, 2018; Rendle et al., 2019), a software for fitting stellar pulsation data, was used as our optimization tool. Stellar parameters and their associated uncertainties were taken as the mean and standard deviation of the resulting posterior probability distribution functions (PDFs), as output by AIMS. Table 3 presents the stellar parameters determined using the model grids described in Table 1 and the sets of observables in Table 2. Our results show that we are able to reproduce the dynamical masses of Pourbaix and Boffin (2016) (Run I) and Pourbaix et al. (2002) (Run II) within 1σ (see Figure 1 and Table 3). We note that the observed luminosity (i.e., 1.521 ± 0.015 L⊙; Kervella et al., 2017) of α Centauri A was not included among the sets of observables as shown in Table 2. This is constrained via the combination of the interferometric radius and effective temperature. Our derived luminosity values are in agreement with the observed values (see Table 4). Run II and Run I luminosity values from both grids are consistent within 1σ and 2σ, respectively. The slight increase in luminosity values obtained in Run I is attributed to the larger interferometric radius used in this run (see Table 2). Table 3. Stellar parameters determined using different grids and observational constraints. Table 4. Luminosities and abundances determined using different grids and observational constraints. Figure 1. Run I (Left) and Run II (Right): Histograms represent the stellar mass posterior PDFs obtained using Grids A (red) and B (black). The dynamical masses (and corresponding uncertainties) of Pourbaix and Boffin (2016) and Pourbaix et al. (2002) are shown in orange and gray, respectively. A clear difference can be seen in the right panel of Figure 1 (Run II) between the stellar mass posterior PDFs obtained using the two grids. Since varying the metallicity mixture has been shown to have a minimum effect on the estimated stellar mass (Silva Aguirre et al., 2015; Nsamba et al., 2018a), this feature can instead be explained by the different core properties of the best-fit models. Table 3 shows that the number of best-fit models with convective cores changes from 46 to 79% when the metallicity mixture is changed from that of Grevesse and Sauval (1998) to that of Asplund et al. (2009). This happens since the dynamical mass of Pourbaix et al. (2002) lies within a range in which the onset of the CNO (carbon–nitrogen–oxygen) cycle, and thus core convection, is highly sensitive to the adopted metallicity mixture. A different scenario is found when considering models that reproduce the dynamical mass of Pourbaix and Boffin (2016), with the stellar mass posterior PDFs showing excellent agreement (Run I; see left panel of Figure 1). The percentage of models with convective cores is now consistent (i.e., ≳ 70%) irrespective of the model grid adopted. We note that best-fit models are on average higher in mass compared to Run II and most have already developed convective cores, with any variation in the metallicity mixture generating no significant difference on their core properties. In Table 3, we show the upper limits of convective core mass (Mc) of our best-fit models. From all runs, we find the core radius to have an upper limit of 0.11 R⊙. Bazot et al. (2012) derived an upper limit on the radius and the mass of a possible convective core in α Centauri A to be 0.059 R⊙ and 0.035 M⊙, repectively. These limits were derived while taking into account the small separation (δν) in the optimization, as this parameter can provide a direct estimation of the convective core characteristics. Furthermore, when exploring the contribution of the different model physics on the nature of the core of α Centauri A, (Bazot et al., 2016), in their Table 3, report the core radius of their best-fit models to vary from 0.026 to 0.084 R⊙, which is consistent with our findings. The top left panel of Figure 2 shows that the derived stellar ages are in excellent agreement irrespective of the grid and observational constraints used. Furthermore, these ages are consistent with literature values (Kim, 1999; Yıldız, 2007; Bazot et al., 2016; Joyce and Chaboyer, 2018; Nsamba et al., 2018b). Table 3 and the top right panel of Figure 2 show that the αmlt estimated based on either Run I (solid lines) or Run II (dashed lines) are consistent within 1σ. The values of αmlt across runs are however distinct, this being mainly due to the different radius constraints used (see Table 2). We note that the interferometric radius measurements used in each run indirectly constrain the model mass. Moreover, αmlt is known to have a significant degree of correlation with the stellar mass and effective temperature (Pinheiro and Fernandes, 2013). Figure 2. 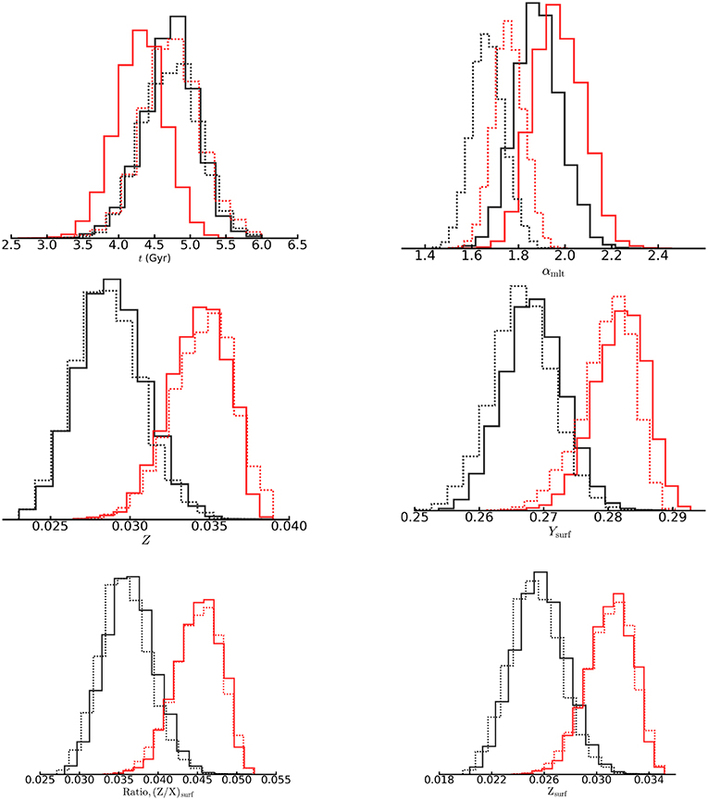 Histograms represent stellar parameter posterior PDFs obtained using different grids (Grid A in red and Grid B in black) and observational constraints (Run I as solid lines and Run II as dashed lines). A clear contrast can be seen in the bottom panels of Figure 2 between the best-fit models obtained using the two grids. As expected, the grid based on the metallicity mixture from Asplund et al. (2009) (Grid B) leads to best-fit models with a lower Z compared to those based on the mixture from Grevesse and Sauval (1998) (Grid A). A similar feature can be seen for the surface helium mass fraction, Ysurf. The model properties that influence the onset of the CNO cycle (and associated convective core) include the adopted physics, metallicity, and mass. As mentioned in section 2, both grids contain the same physics apart from the metallicity mixture. We note that models with high metallicity have a higher chance of developing convective cores. This is because a high metallicity leads to an increase in opacity, which in turn reduces the efficiency of radiative energy transport. This ultimately results in an increase in core temperature which favors the onset of the CNO cycle. Similarly, models with a higher mass have high core temperatures, hence higher chances of developing a convective core. Top left panel of Figure 3 shows best-fit models with high mass develop large convective core radii and core masses. This could be explained by their high overshoot parameter values as shown in the bottom panel of Figure 3. Best-fit models with fov = 0 have smaller core masses and core radii (see bottom panel of Figure 3). Top right panel of Figure 3 shows no clear trend regarding the contribution from the initial metal mass fraction toward the core masses and core radii. Figure 3. Scatter plots showing core radius (Rc) vs core mass (Mc) for best-fit models with convective cores obtained using grid B (Run I). Top left is color-coded according to the model mass (M), top right is color-coded according to the initial metal mass fraction (Z), and bottom panel is color-coded according to the overshoot parameter (fov). Its interesting to ascertain the most dominate model property that facilitates the occurrence of convective cores for the best-fit models obtained in each Run. Despite the high metallicity of best-fit models of grid A (Run II) (see bottom left panel of Figure 2), the majority of these models have masses ≲ 1.1 M⊙ (see right panel of Figure 1) resulting into 46% of models with convective cores. Grid B (Run II) contains most of the best-fit models with low metallicity but with masses ≳ 1.1 M⊙ (see right panel of Figure 1) leading to 79% of models with convective cores. Hence, for Run II (both grids), model mass is the most dominant model property responsible for the onset of CNO cycle. For grid A (Run I), it is challenging to determine the most essential model property that yields convective cores. 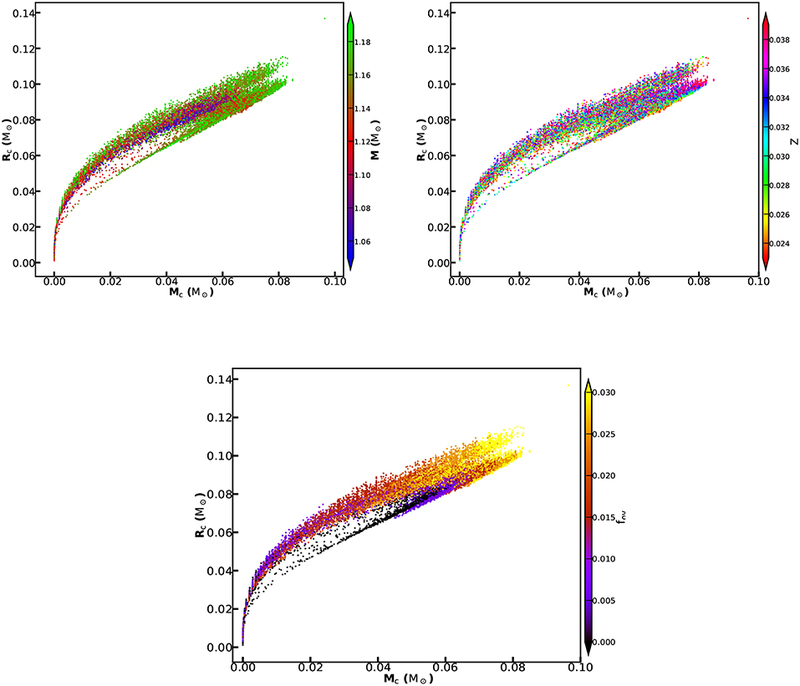 This is because most of the best-fit models have mass ≳ 1.1 M⊙ and high metallicity (see left panel of Figure 1 and bottom left panel of Figure 2). However, for grid B (Run I), the majority of the best-fit models have low metallicity but masses ≳ 1.1 M⊙ and 79% of models with convective cores. Therefore, also in this case model mass is the dominant model property contributing toward the onset of CNO cycle. Further, our results show that the mass range over which models constructed at different metallicities are expected to develop convective cores is 1.05 – 1.15 M⊙. In Paper I we assessed the impact on the nature of the core of α Centauri A of varying the nuclear reaction rates, which showed that ≳ 70% of best-fit models reproducing the revised dynamical mass of Pourbaix and Boffin (2016) have convective cores. In this article, we expand on the previous work by exploring the impact of varying the metallicity mixture (and corresponding opacities). Our findings show that ≳ 70% of best-fit models reproducing the revised dynamical mass have convective cores. In sum, the percentage of best-fit models with convective cores remains above 70% when imposing the most up-to-date set of observational constraints. This happens irrespective of the adopted metallicity mixture and nuclear reaction rates. Therefore, we propose that α Centauri A be adopted in the calibration of stellar model parameters when modeling solar-like stars with small convective cores. During the “standard” solar calibration process, the initial metal mass fraction (Z), initial helium mass fraction (Y), and the mixing length parameter (αmlt) are varied until a model is attained that satisfies the observed oscillation frequencies, effective temperature, metallicity, luminosity, and radius at the current solar age. The same model physics and solar calibrated parameters are then used to create stellar grids for modeling other stars. Unlike the case of the Sun, there is no model-independent age for α Centauri A, but we do have a precise dynamical mass, interferometric radius, effective temperature, metallicity, and luminosity. In addition, we currently have ground-based seismic data, with the quality of those data expected to improve with the planned observations of the star by space-based missions such as NASA's Transiting Exoplanet Survey Satellite (TESS; Ricker et al., 2015; Campante et al., 2016) and ESA's PLAnetary Transits and Oscillations of stars (PLATO; Rauer et al., 2014). This will improve the precision of observed oscillation frequencies and is also expected to increase the number of oscillation frequencies for all observable spherical degrees (l). This will support a more comprehensive asteroseismic analysis than the one presented here and in Paper I. Therefore, with all these sets of observables, it will be possible to carry out a calibration procedure similar to the “standard” solar calibration routine briefly described above, without having the age among the constraints. It will also be feasible to provide effective constraints on some aspects of the physics, namely convection (mixing length, overshoot, surface effects), diffusion and opacities. The potential for constraining reaction rates is also a possibility when two or all stellar components of this triple system have seismic data of high precision available. SS provided the spectroscopic parameters. The rest of the authors were involved from the start of the project, through generation of stellar grids and discussion of results. This work was supported by FCT - Fundação para a Ciência e a Tecnologia through national funds and by FEDER through COMPETE2020 - Programa Operacional Competitividade e Internacionalização by these grants: UID/FIS/04434/20190, UID/FIS/04434/2013, & POCI-01-0145-FEDER-007672, PTDC/FIS-AST/30389/2017 & POCI-01-0145-FEDER-030389, and PTDC/FIS-AST/28953/2017 & POCI-01-0145-FEDER-028953. BN is supported by Fundação para a Ciência e a Tecnologia (FCT, Portugal) under grant PD/BD/113744/2015 from PhD::SPACE, an FCT PhD program. TC acknowledges support from the European Union's Horizon 2020 research and innovation program under the Marie Skłodowska-Curie grant agreement No. 792848 (PULSATION) and from grant CIAAUP-12/2018-BPD. SS acknowledges support from FCT through Investigador FCT contract No. IF/00028/2014/CP1215/CT0002 and from FEDER through COMPETE2020 (grants: UID/FIS/04434/2013 & PTDC/FIS-AST/7073/2014 & POCI-01-0145 FEDER-016880). Based on data obtained from the ESO Science Archive Facility under request number SAF Alpha Cen A 86436. T.
We acknowledge the referees for the helpful and constructive remarks. BN would like to thank the MESA community for advice on how to handle specific issues regarding the fine-tuning of the MESA code so as to produce sensible results. BN would also like to thank the members of the asteroseismology group at the Instituto de Astrofísica e Ciências do Espaço for their feedback, which added value to this work. 1. ^ In this work, models that are representative of a set of observables are termed as best-fit models. Aerts, C., Christensen-Dalsgaard, J., and Kurtz, D. (2010). Asteroseismology. Astronomy and Astrophysics Library. Dordrecht; Heidelberg; London; New York, NY: Springer. Asplund, M., Grevesse, N., and Sauval, A. J. (2005). “The solar chemical composition,” in Cosmic Abundances as Records of Stellar Evolution and Nucleosynthesis; ASP Conference Series, Vol. 336, Proceedings of a Symposium Held 17-19 June, 2004 in Austin, Texas, eds T. G. Barnes III and F. N. Bash (San Francisco, CA: Astronomical Society of the Pacific), 25. Böhm-Vitense, E. (1958). Über die Wasserstoffkonvektionszone in Sternen verschiedener Effektivtemperaturen und Leuchtkräfte. Mit 5 Textabbildungen. Zeit. Astrophys. 46:108. Grevesse, N., and Sauval, A. J. (1998). Standard Solar Composition. Space Sci. Rev. 85, 161–174. Herwig, F. (2000). The evolution of AGB stars with convective overshoot. Astron. Astrophys. 360, 952–968. Iglesias, C. A., and Rogers, F. J. (1996). Updated opal opacities. Astrophys. J. 464:943. Kim, Y.-C. (1999). Standard stellar models; alpha Cen A and B. J. Korean Astron. Soc. 32, 119–126. Söderhjelm, S. (1999). Visual binary orbits and masses POST HIPPARCOS. Astron. Astrophys. 341, 121–140. Copyright © 2019 Nsamba, Campante, Monteiro, Cunha and Sousa. This is an open-access article distributed under the terms of the Creative Commons Attribution License (CC BY). The use, distribution or reproduction in other forums is permitted, provided the original author(s) and the copyright owner(s) are credited and that the original publication in this journal is cited, in accordance with accepted academic practice. No use, distribution or reproduction is permitted which does not comply with these terms.